﻿﻿﻿﻿﻿﻿﻿﻿The chromatin structure affects the probability of the damaging agents to cause DNA breaks and the recruitment of the repair proteins. Ultraviolet light-induced DNA damage response is an extensively studied process because improper or delayed repair of the errors could lead to cancerous malformations. Mutations of P53 tumor suppressor are associated with several human cancer. Beside of the P53 tumor supressor function, it has been recently described in yeast that P53 implicated in in transcriptional elongation. 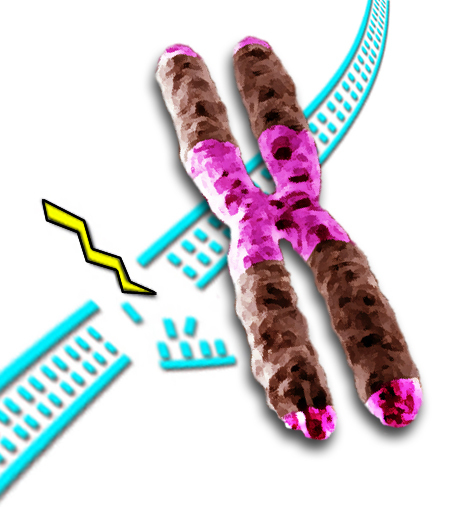 Ultraviolet light-induced DNA damage response is an extensively studied process because improper or delayed repair of the errors could lead to cancerous malformations. Although several proteins involved in DNA damage repair have been identified, the entire repair cascade and the protein-protein interactions remain to be explored. 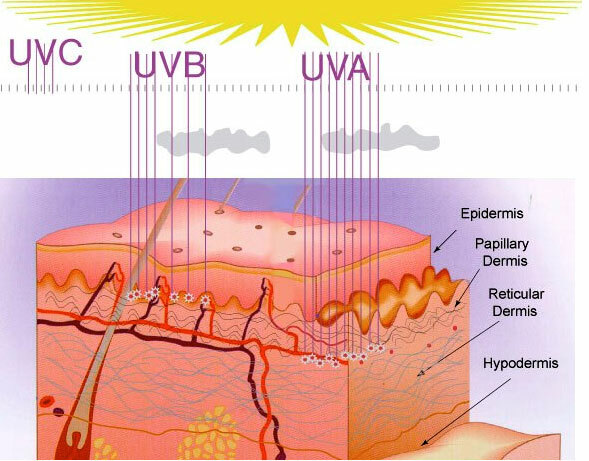 Based on the wavelengths UV light is classified as UV A, B and C. UV C irradiation is absorbed mostly by the ozone layer, therefore under normal circumstances, UV A and UV B are the major causes of DNA damage in epidermal cells. In order to study the process of DNA damage response upon UV B irradiation, we used keratinocyte cells to test their DNA repair abilities and analyze the possible mechanism which could lead to skin cancer progression. In a primary screen we identified a gene as one of the most dramatically up-regulated gene in keratinocytes following UV B irradiation. It is a protease inhibitor which promotes cell proliferation under normal circumstances in hematopoietic and myeloid leukemia cells. The genome of the cells is continuously challenged by DNA damaging agents. These factors are originated from the environment and also from the normal metabolic pathways of the cells. DNA lesions have to be repaired and during repair transcription, the movement of RNA Polymerase II on the DNA template, has to be arrested leading to global transcription block. For cell survival and restoration of normal cellular functions different signaling pathways need to be activated including either DNA repair or apoptosis, which are often deregulated in tumor cells. In spite of the global inhibition of transcription the expression of certain genes is crucial for the activation of these pathways. Based on our previous results we suppose that upon UVB triggered DNA damages the transcription initiation of these specific ‘crucial’ genes is differently regulated, compared to the rest of the expressed genes that need to be inhibited,. The aim of the proposal is to investigate the global and gene specific regulation of transcription initiation during different DNA damaging conditions. To address these issues we plan to apply recently developed genome-wide and genome editing methods. These results will help exploring a new aspect of transcription regulation and also the better understanding of the survival strategies of the cells. We hope that our novel findings will contribute to the identification of novel cancer therapy targets and development of new therapies . At recent days the detection of cancer progression is one of the highest challenge for the medical sciences. The cases of cancerous malformations show increasing tendency and they affect huge number of population. For example in 2013 over 30 million new patients were documented which means one person is affected out of 200 people all around the world. For these patients it is crucial to detect and start the therapeutic processes within the first 2 years because the survival rate is approximately 70% at this time. After this threshold the survival rate in some special cancers is reduced 4 percent, but the average is still at around 10%. Today the process of cancer detection and the medication period of the cancerous patients at the hospitals could take months which is largely affects the surviving chances of the patients. Our goal is to develop a new test platform which could accelerate the process of detection and diagnostic window of the tumors by decreasing the required time to days instead of months. It will also provide direction for the suitable medical treatment and will give assistance for the categorization of the cancer sample.